Retina-Vitreous Associates Medical Group is equipped with a state-of-the-art Visual Function Laboratory capable of performing electroretinography (ERG), electrooculogram (EOG), multifocal electroretinography (mf-ERG), autofluorescence, and visual field (Humphrey and Goldmann) testing. The Visual Function Laboratory at Retina-Vitreous Associates Medical Group has a full team of qualified and certified technicians and photographers solely devoted to performing all of the highly sophisticated tests mentioned above. The Full Field ERG is used to measure retinal cell function. This test is clinically useful in a number of hereditary and degenerative retinal diseases. A multifocal ERG also measures retinal cell function and focuses on different areas of the retina, in particular, detailed information about macular retinal cell function. This helps in looking for localized areas of abnormality in the macula. 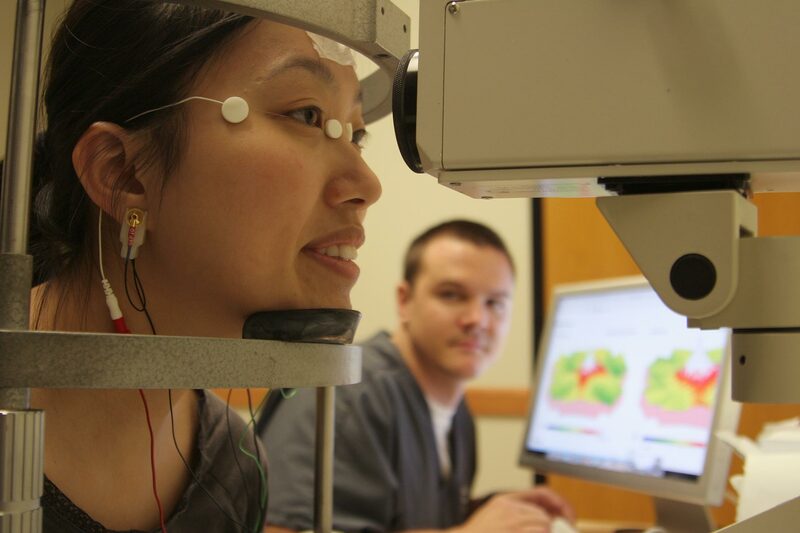 The VEP/VER is a test that evaluates visual signals reaching the brain. It measures the time it takes for nerves to respond to stimulation, evaluating the visual pathways in the brain. This test is useful in detecting blindness in patients who cannot communicate, and for detecting conditions such as optic neuritis and Multiple Sclerosis. The Humphrey Visual Field measures the individual’s entire scope of vision (central and peripheral vision). The test involves static light stimuli. The Goldmann Visual Field measures the individual’s entire scope of vision. The test involves moving light stimuli. The Octopus Static Visual Field is similar to the Humphrey Visual Field. It involves static light stimuli. The Farnsworth-Munsell D-15 is a useful test for screening for color vision defects. It can be used to detect color blindness such as red-green and blue-yellow color blindness. The Farnsworth-Munsell 100 is a more detailed analysis of color blindness and helps quantify a person’s ability to accurately perceive colors.